Well we have had a busy summer and fall. Dasher and I had a great time trialing. We have had our ups and downs. 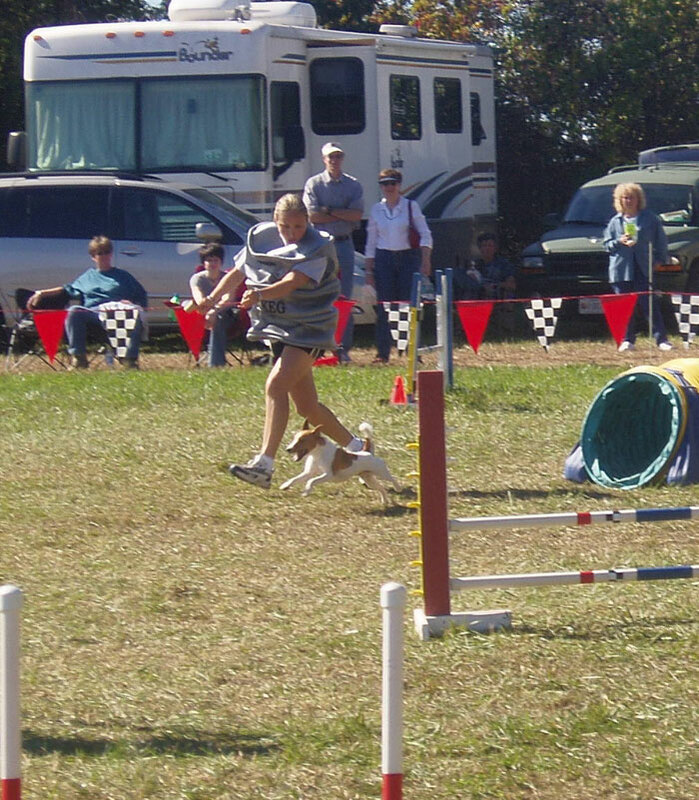 In Sept, we went up to New York for the Y Agility trial at Blackthorne resort. It was our first time at Blackthorne, we drove up with my friend Jeannette H. and we had a blast!! We got a Q and 1st in our Master’s Jumpers class. Not only we were happy with the Q, but we got tons of top 10 points as our class was pretty big. The rest of the weekend less than stellar. Dasher decided this would be a good time to blow his start line stay. So for the next few trials worked really hard to correct this. Man it was tough to walk out of a class before Dasher took the first jump when he would break his stay!! Luckily his start line has gotten much better but it will always be a work in progress. In October we entered the Fairhill trial. We did the team competition for the first time. It was tons of fun!! Our team did not have a very good showing but it was a great experience. For the team relay our team dressed up since Halloween was just around the corner. Here is a picture from the team relay, I am dressed up as a beer keg! Another bit of news on the dog front…..we have a new addition!! 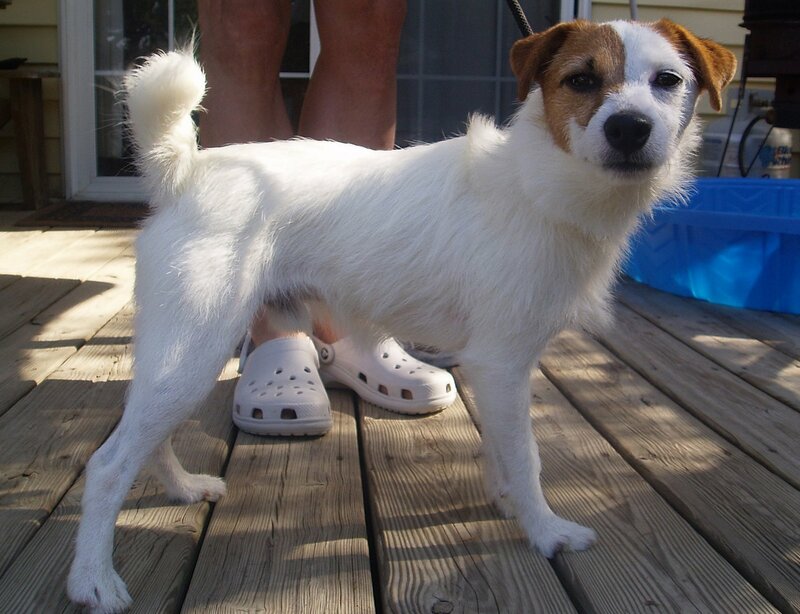 At the end of June we adopted a JRT from the humane society. I sit on the board of our local humane society and came in to the shelter for a meeting. 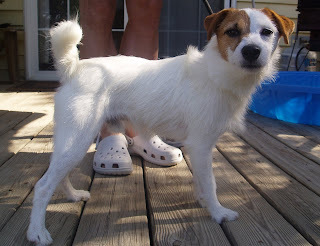 A friend on the board told me to go back to see the stray JRT they recently picked up….well that was the end of that!! Introducing Zip!! 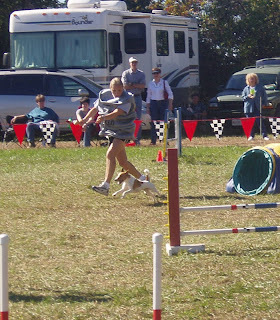 Zip and I have started agility classes and he is doing great. I think he really likes the game!! Brandon and I have been busy. We have not had a chance to get away since Belize earlier this year. Hopefully we will have a chance to get away sometime this winter. We have 2 trials left in 2007, then we will have a bit of a break for the winter months.